Fanatical about flavor and freshness, Sushidokoro Mekumi’s chef is like a professor studying his ingredients and researching daily for ways to make their umami pop. Attracted by his truly unique style, top chefs and gourmands flock to Kanazawa from all over the globe to discover just how delicious freshly caught, top-notch sushi can be. This is Nonoichi City. Voted one of Japan’s most livable cities, it is far less well-known than its glamorous neighbor Kanazawa on the Japan Sea side of Honshu. And with a fifteen-minute taxi ride from Kanazawa Station, it is an understatement to say Sushidokoro Mekumi is off the beaten path. But it clearly offers something special given its lofty position on the lists of chefs and gourmands who make their way here from around the world. 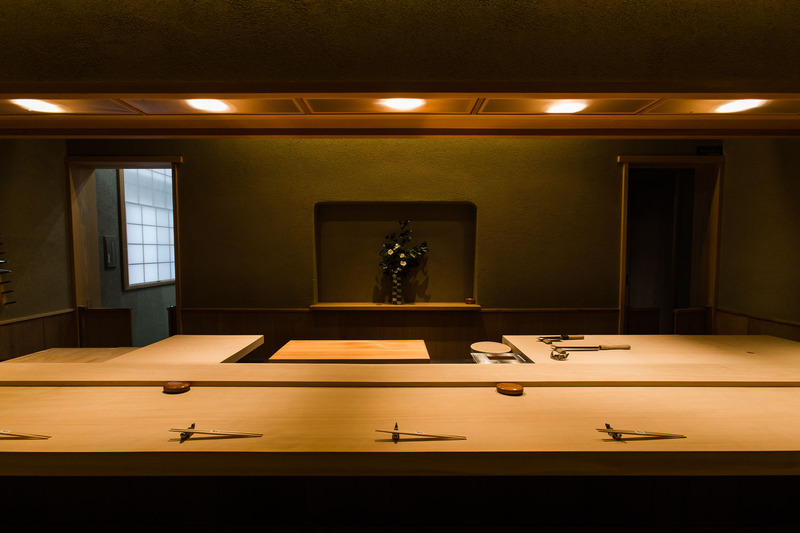 Chef Yamaguchi put all his emotional and financial resources into renovating his restaurant five years ago. No expense was spared in creating this elegant, shrine-like interior with its gentle indirect lighting. 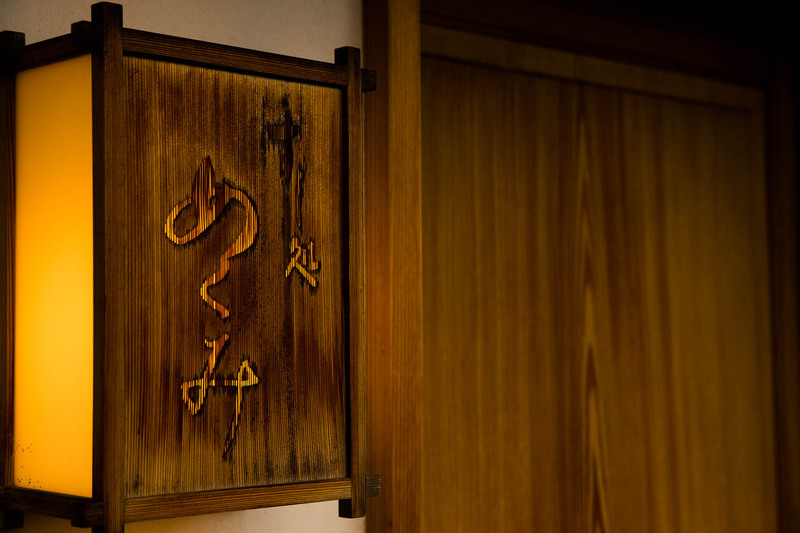 The sliding door entrance reveals a striking seasonal flower arrangement created by the chef himself, and a wide hallway lined with shikkui stucco walls sweeps you into the restaurant with just eight counter seats. The timber counter comes from a 400-year-old hinoki Japanese cypress tree, and absent of any knots, this extremely rare straight grain timber is typically reserved for castle citadels. The stucco walls incorporate diatomaceous earth, of which large deposits exist on the Noto Peninsula, and it is touches like this that make Yamaguchi’s love for his native Ishikawa exude from every corner. The reward for the chef who bases himself outside of the big cities is found in the ultra-fresh seafood at his fingertips and strong local connections that ensure the earliest notice of premium seafood’s impending arrival. Tsukiji Market in Tokyo is constantly sourcing quality ingredients from all over. In contrast, because the market is limited in regional cities around Japan, there are major variations in availability. To mitigate the risk in supply, Yamaguchi makes a circuit of all the local ports even vaguely within his reach. Fanatical about his ingredients, the chef takes a scientific approach to determining the ideal preparation method of each protein to maximize umami. He talks about the ratio of umami released from fatty acids and amino acids, the difference between aging and fermentation, and all kinds of other scientific factors you don’t usually hear at your local sushi restaurant. Rather than aging fish on instinct and experience, Yamaguchi is working with university researchers to determine how what the fish eats affects the fatty acids in their flesh, and in turn how long the fish should then be rested for the maximum release of umami. Fanatical about flavor, Yamaguchi’s appetizer dishes are total umami explosions. He is not an attention seeker, and not a single dish or even element is there simply for show. Kobakogani female snow crab and generous amounts of its roe are served with a subtle crab vinegar. Fishing commences on November 7 each year for this precious seafood, which can only be enjoyed until year-end. 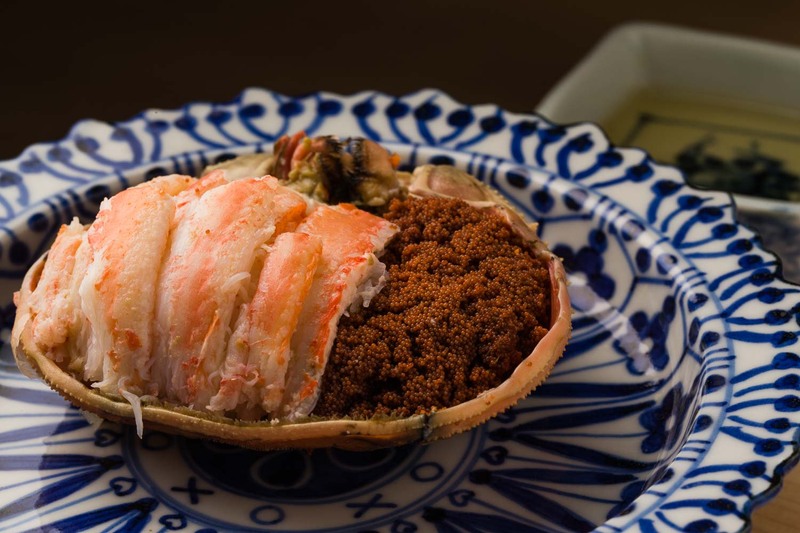 In general, Yamaguchi typically only uses female crab varieties because they exhibit levels of umami on a totally different scale. The new year brings with it the excitement of the chance to enjoy female kegani hairy crab. Only caught in extremely limited areas, very few the world over have the pleasure of knowing this delicacy. Its innards are laced with fat making it one of the most delectably rich foods you may ever eat. Homemade dried mullet roe, created through an elaborate process, has the added step of lightly charring just before service to intensify its innate aromas. 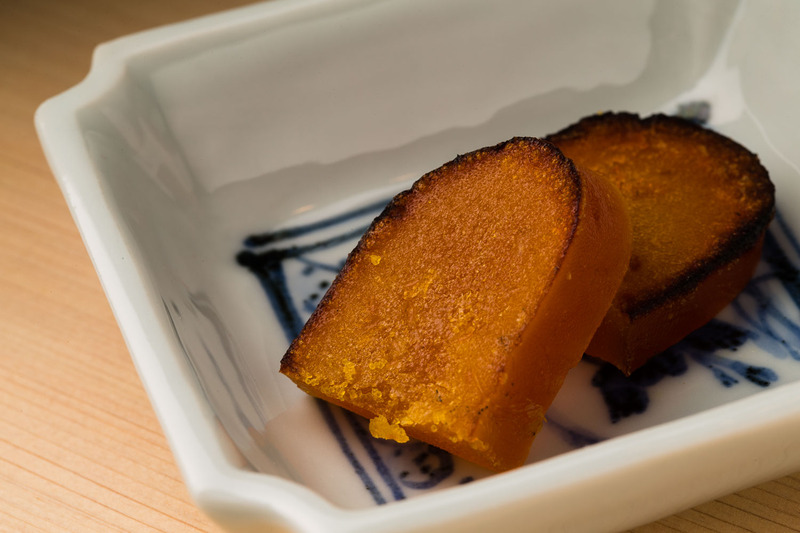 This year, the local mullet roe was lacking the necessary fat, forcing Yamaguchi to search further afield in Kyushu, showing that while he is dedicated to showcasing local ingredients, he will bring them in from other areas when there is a question on quality. 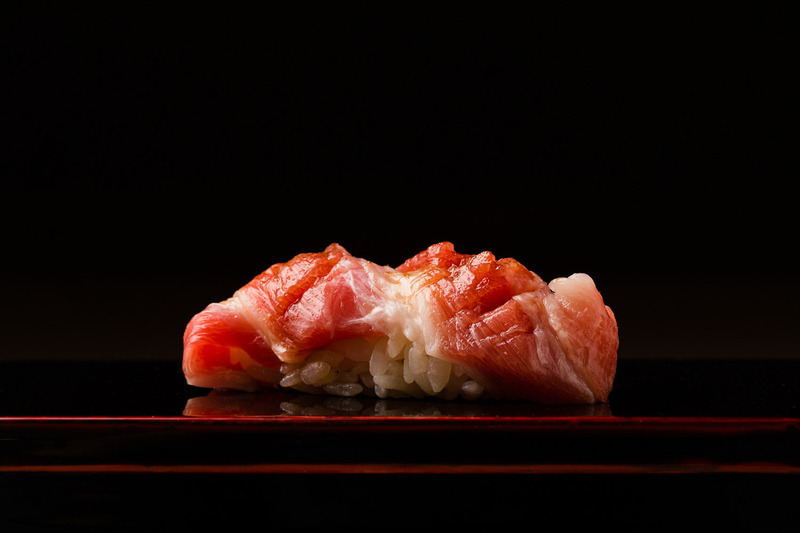 Otoro fatty tuna from Oma, Aomori, typically makes its way through Tsukiji to the sushi chefs around Japan, but Yamaguchi sources his direct from the port. 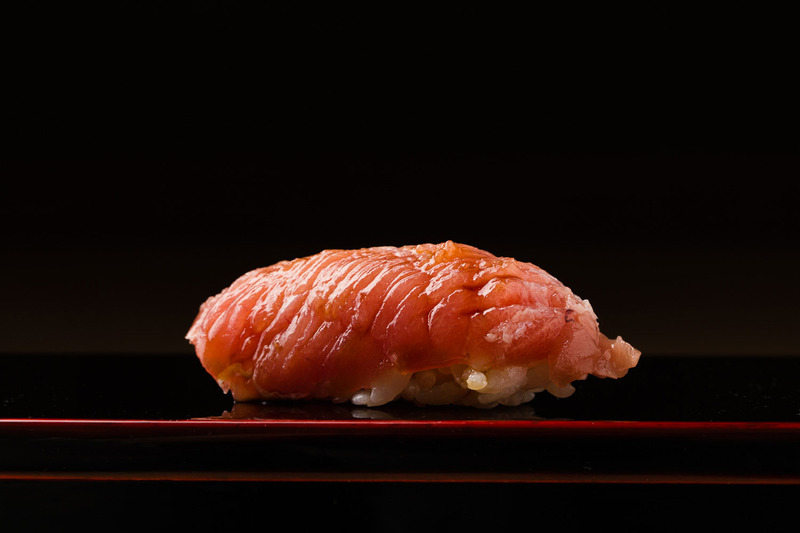 A rare feat, this tuna is aged for about 10 days before serving. 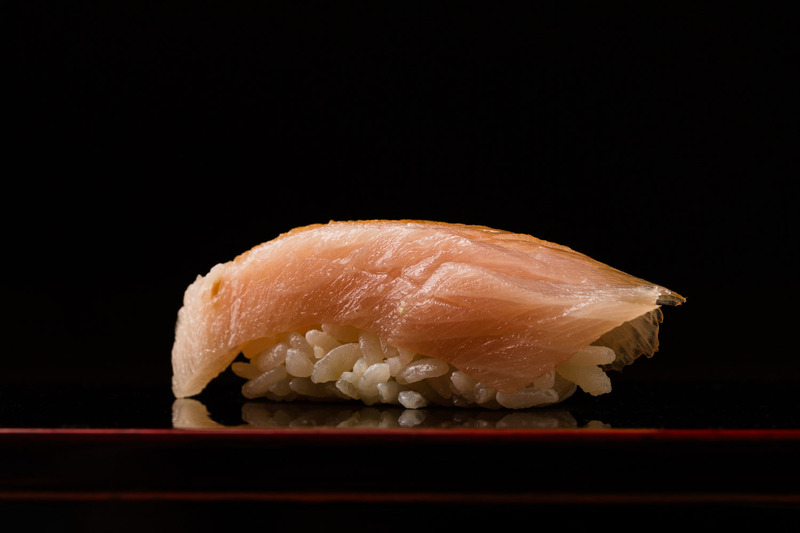 Katsuo skipjack tuna caught in the ocean off Ishikawa is brought into the restaurant live, broken down and aged for five days, utilizing the freshness and a method simply not possible with this fish if you were based in Tokyo. Yellowtail is aged for up to ten days depending on the part, and gizzard shad has a slight tang having been pressed in vinegar. No quality produce of the latter was available on the market this year, but a special relationship with the fisherman meant Yamaguchi could obtain his own special lot. The change in squid varieties reflects the shifting of the seasons: autumn akaika red squid makes way for the aoriika oval variety as winter sets in, followed by delicious yariika spear squid. 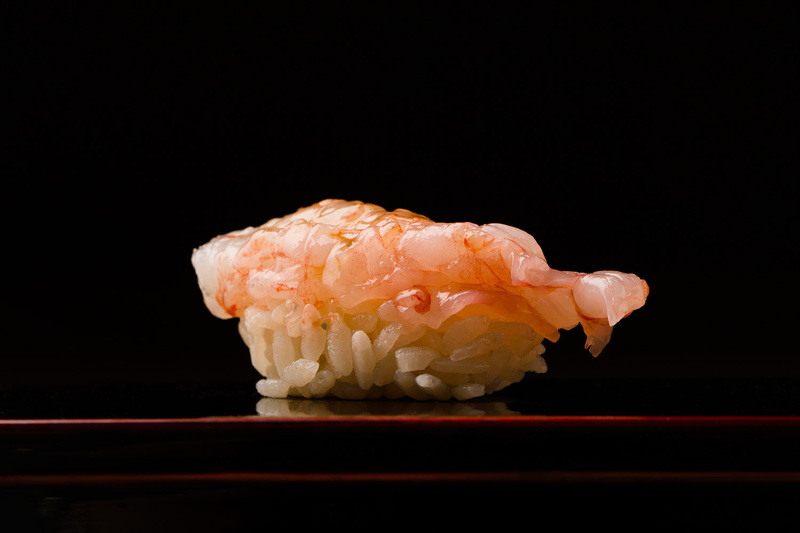 And Toyama sweet shrimp…simply the best. By virtue of running a business away from the big cities, Yamaguchi is driven to showcase the incredible bounties of this region. With total devotion to local ingredients, simply listening to the chef describe his day sourcing them is exhausting. So tireless is the chef that it is hard to know where to count the start of his day, but it always ends with guests fully satiated by the incredible ingredients laid before them. Many chefs come to dine especially at Mekumi, the vast majority seeking to experience and understand the difference in quality and freshness offered by the surrounding seas. Every day Yamaguchi heads to Nanao Market, about 100 km away on the Noto Peninsula, to buy direct from the fishermen and fishmongers there. He boards the boats to learn what they have caught and where, as well as what the fish are feeding on, to find the true tastes of the season in superb condition. In crab season, which starts in November, Yamaguchi catnaps for one hour after the restaurant closes at around 1:30 a.m. He wakes to go to market for the crab, then heads to Kanazawa Central Market for other produce, and around 6 a.m. begins the 90-minute journey to Nanao. Back at 11 a.m., it’s time for prep and before long the first customers for the evening will be arriving. With only two to three hours of sleep each day, an enormous proportion of Yamaguchi’s time is spent shuttling between the markets of Hokuriku sourcing the very best. He simply cannot resist these Hokuriku winter ingredients and is driven by the desire to share them with his treasured guests. Takayoshi Yamaguchi is from the hot spring town of Yamanaka tucked away in the mountains outside of Kanazawa. His father is a lacquerware artisan and every item of lacquer at Mekumi is a treasured piece from his father. Contemplating his future as a junior high school student, Yamaguchi felt the job options were limited in a hot spring town, but that there would always be a need for chefs. He worked part-time in the kitchens of a hot spring hotel throughout his school days, but never found the desire to become a chef. Intimidated by the commitment expected of him should he follow in his father’s career footsteps, he left for Tokyo after graduating from high school and took up work as a caregiver for the elderly. 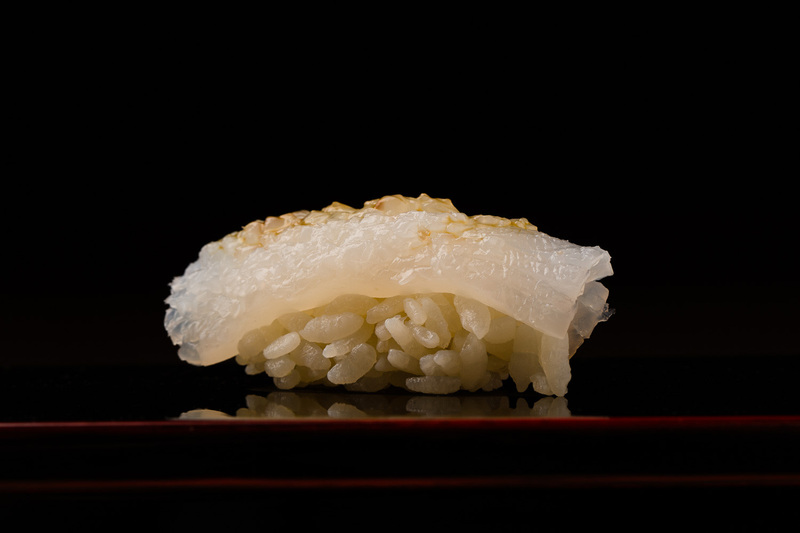 Armed with his certification and earning a reasonable salary, an unlikely opportunity arose to work at Hokake, a sushi institution that opened in Ginza in 1937. Raised in the mountains, Yamaguchi was never especially interested in seafood, but the freshness and lack of fishy flavor in the staff meals took him totally by surprise and piqued his interest in sushi. He worked at several restaurants before heading home to Kanazawa at age 29 to establish his own restaurant exactly where Mekumi stands today. Yamaguchi is a fascinating man. He doesn’t love sushi nor would you say he was destined to run a sushi restaurant one day. But his efforts have created a following of loyal customers to whom he feels a strong sense of responsibility. He explains the logic behind flavor with a professor-like scientific approach to sushi and umami. But when it is suggested that once he grasps the quantitative statistics behind sushi’s deliciousness he can create an enormously successful sushi chain, he is quick to rebut. “Not a chance. Because sushi chefs shape sushi with their hearts. It’s the culmination of daily visits to fish markets, meeting with fishermen face-to-face, and obtaining quality ingredients….When that spirit can be tasted, only then is sushi truly delicious. It’s true I take a systematic approach, but the biggest influence on the flavors I achieve come from my heart.” More than likely, it is this true artisan spirit inherited from his father that attracts so many guests from near and far. 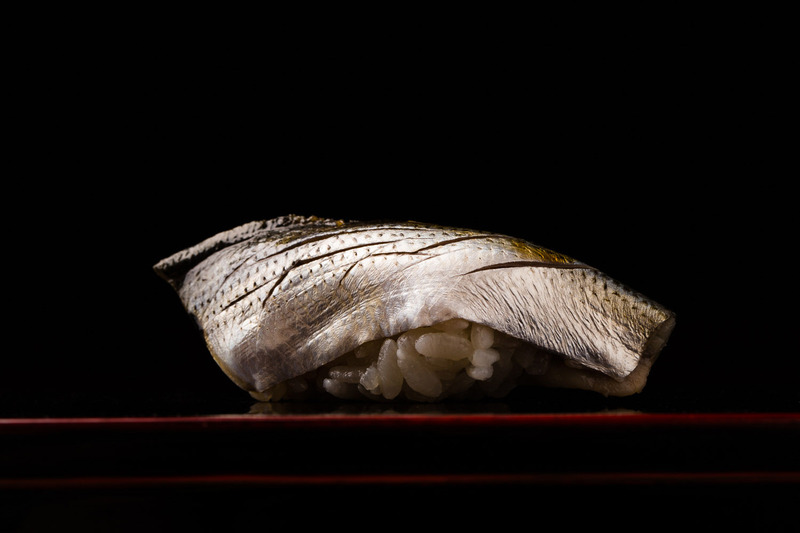 Yamaguchi may be the only one to say that his sushi is far from perfect. To reach that illusive level, he plans to continue with his scientific approach for drawing out each ingredient’s ultimate flavors not on instinct, but through solid quantitative analysis, perfecting his own unique style as he goes. The kiln of Suda Seika creates all the ceramic pieces used at Mekumi. 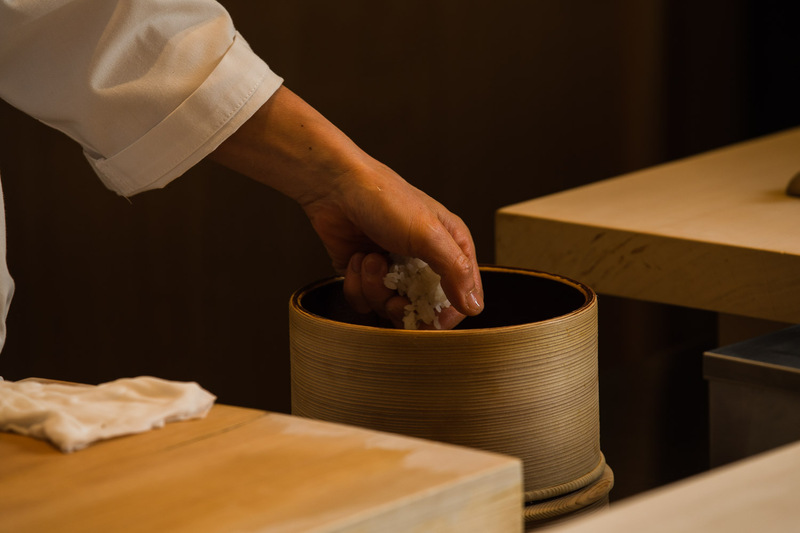 Located in the mountain town of Yamashiro Onsen, near Yamaguchi’s hometown, the kiln specializes in Kutani-yaki. 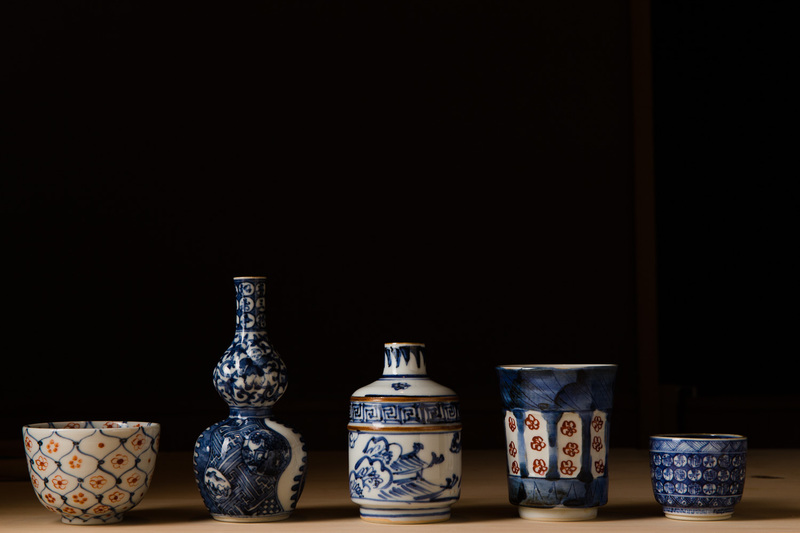 It gained fame as the first place multi-talented artist Kitaooji Rosanjin tried his hand at pottery making. Each piece takes six months to a year to complete, but Yamaguchi loves the fullness and gentle qualities they all possess. 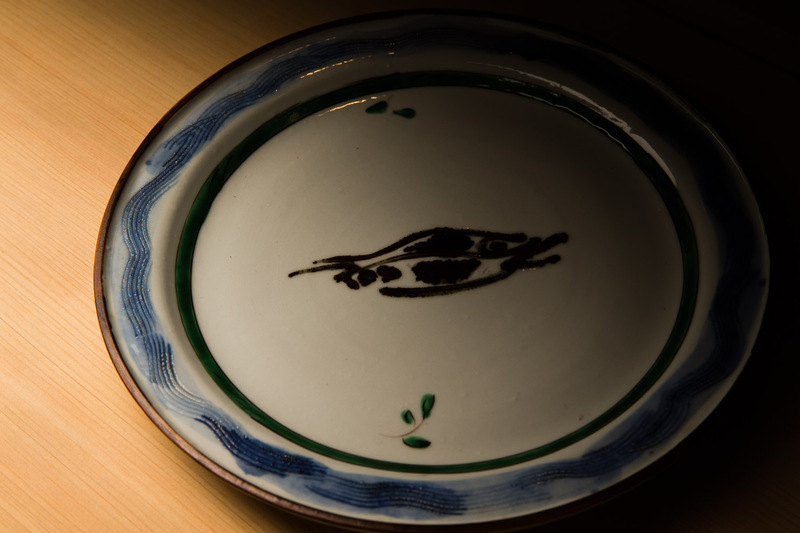 With fresh local seafood and local sake, the locally produced tableware completes the dining experience, leaving guests with the true tastes of Kanazawa and the greater Hokuriku region. 2 seating times: 6PM- and 8:30PM-.